Allie Reece first started practicing yoga as a way to clean up her mind and heal her heart. From the beginning, she intuitively knew that yoga would help but she never imagined that she had stumbled upon a sacred jewel that would change her life forever. With practice, Allie improved her focus and concentration, and she was pleased to discover that yoga provided her with so much more: her mental attitude shifted, she felt in harmony with everything around her and she became more centered and grounded. It was as though she had finally found what she was looking for. As a natural extension of her spiritual practice, Allie joined a 10-Day Hridaya Silent Meditation Retreat. It was her first meditation retreat, so she was a little nervous and very excited! Much like her initial experience with yoga, Allie’s first retreat experience far surpassed expectation. She had no idea that such profound changes would occur in such a short amount of time! From that point on she way hooked on Hridaya, and sat as many retreats as possible. Allie became a yoga teacher in 2008. Teaching yoga has been the biggest blessing in her life, something by which she is humbled and for which she is immensely grateful. After a few years of practicing and teaching yoga, and after hours of meditation, Allie has come to realize that one of her purposes this lifetime is to pass along the sacred teachings that she has been blessed to receive. 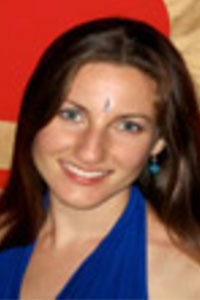 In 2011, Allie was fortunate to participate in the first Hridaya Yoga Teacher Training course. Learning more about Hridaya Yoga, the Spiritual Heart, Self-Enquiry, and Spanda was pure Grace, and she enthusiastically wants to share this knowledge with anyone who is interested! Allie wants to thank all of her spiritual teachers for their love, inspiration, dedication, nurturing, guidance, and example. She especially wants to express her deep gratitude for Sahajananda and Antoaneta for being beacons of light, love and the Divine in her life.